Huascarán is the highest mountain in Peru, and also the highest mountain in the tropics. Climbing Huascaran is the goal for many climbers who come to South America. Although Huascaran is not technically difficult, due to its high altitude, it is considered a difficult mountain to summit. Good physical condition and acclimatization is required before attempting the climb. we drive towards Yungay and further passing the Village Mancos on our way to Musho. Here, at a height of 3000 meters, our tour begins. By feet we will pass a small grave yard right next to a scenery eucalyptus forest. Further up these trees are replaced by Quinual trees, which are nowadays quite rare in South America. At a height of 4100 meters we will reach a vegetation free area, a perfect place for our camp, so we are ready to build up our tents. For these 1000 meters we get support from our packing animals, so that this part should be managed a lot easier. Later on the Mules can be replaced by porters, as it gets almost impossible to move for the Mules in the rocky and icy regions. Comprises again 1000 meters into the height; fortunately we don't have to carry our baggage. We will cross wide panorama highlands with interesting forms of the vegetation. These lead us directly into the lower glacier border, where we can take on the crampons for the first time. The glacier is maximal 30 degrees steep; the few small gaps are not really risky. Our camp is located at a height of 5100 meters on a flat icy area. Canaleta Very early we leave the camp as today's way will be a bit steeper - Around 40 degrees steep is the ice at the beginning. Until reaching the key point of the whole area, the so-called "Canaleta", a 70 degree steep ice colour. Fortunately these are not 1000 meters and our mountain guide ensures us safely from above. After having overcome this steep part the way gets significantly flatter, nevertheless a few gaps are included. Later on we have to watch out again as we are crossing a avalanche endangered zone. After having managed also this barrier, we prepare our camp underneath the broad icy wall Garganta. This is located at a height of 5900 meters at a more or less wind safe site. From here on we will start our ascend to the summit, but don't worry, this can wait until tomorrow. Race to the top Now it get's serious - At 2 o'clock in the morning we head up to the highest summit of Peru. First of all we have to overcome the Garganta, the steepness comprises 45 degrees. Around us appear enormous Seracs, in between we will search our way. This gets again a bit flatter and soon we have reached the summit. This is the viewing point ever in the Cordillera Blanca region. The deep views into the Santa valley are just indescredible, nearly endless the wideness of the surrounding ice mountains. Unfortunately we cannot stay too long, as it is too cold and the descend is still waiting for us. We take the same route as ascend and should reach Camp 1 today. At Campo 2 the tents will be broken down and there is enough time to make a nice break including a hot cup of tea and some biscuits. The Canaleta normally has to managed by roping down, before finally building up another time our tents at Camp 1 or morrena Camp. Depending on how much we have managed yesterday, we can finally take it a bit easier today and enjoy the wonderful mountain area around us. 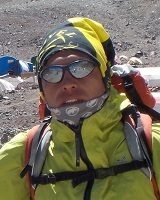 We will carry on to the base camp at a height of 4250 meters, where a much nicer climate for camping is waiting for us. We don't have to get up early as we have enough time for the last 1100 meter downwards. Also today we will use the ascend route through marvellous mountain forests and old shepard trails. In Musho, a vehicle is waiting for us to take us back to Huaraz.